Here’s an oldie but goodie of mine. Pics and products used listed below! I absolutely adore your work, it aspires me to learn more about effectively applying my eye make-up in the correct form. It’s also wonderful, that you provide adequate instructions, tips and product suggestions. I recently started watching your videos and since then gained your makeup style. It’s a wonderful feeling to walk outside my house receiving several compliments on my eye makeup, therefore, I hold my head up high. I hope that you will continue to provide more innovative makeup styles for 2009. Keep up the good work! Great tips. I miss your purple hair! 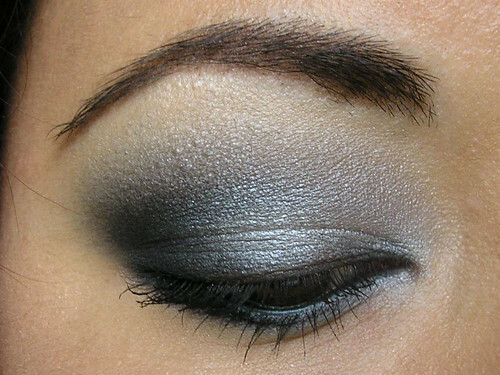 I love this smokey eye…I do it all the time. i love your site!! i discovered you a couple months back and can’t get enough of all your tips… i tried this smokey eye fore NYE and it was a major success!! i was wondering if you could go into more detail about the brushes you use: which you recommend, and which are must haves… i don’t have all the adequate tools, but need help in selecting the right ones…. I was looking for something to go with my black and silver ballgown…and I think this is a winner! Me encanta maquillar mis ojos y estos tips de maquillaje son realmente buenos, muchas felicidades a la maquilladora!! !